Harvey’s numinous work, The Annunciation (2011), was written as part of the Quincentenary celebrations of St John’s College. Each day we rehearsed The Annunciation and I e-mailed a sound recording to the composer and then we spoke on the phone. It was an intensely moving dialogue. Harvey explained how he could no longer hold a pencil or play the piano and that he thought these notes would be the last he would ever compose. Mercifully a little more music followed. I later read the following words of the composer: Pain and suffering experienced in life increase the artist’s determination to create an ideal world through his music. A year further on The Annunciation, which seems to inhabit an ideal world, was nominated for a British Composer Award. The day after the awards ceremony the composer passed away after his long experience of Motor Neurone Disease. We sang this work at his memorial service. Harvey once quoted Debussy’s explanation of how he had written La Mer when away from the sea: But I have an endless store of memories; to my mind, this is worth more than reality. At the end of his life Harvey continued to turn back to previous sources of inspiration. He had set Edwin Muir’s poem, The Annunciation, quite differently over 40 years earlier. The passage that it makes each feather tremble on his wings makes musical reference to Harvey’s Messages, an ecstatic work which sets only angel names in their nine hierarchies. 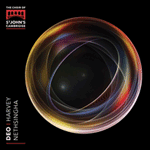 The Annunciation takes Palestrina’s Stabat Mater as its starting point, Harvey having previously elaborated the same work in music for choir and live electronics in 2004. Harvey cited Domenico Veneziano’s The Annunciation, in Cambridge’s Fitzwilliam Museum, as a model for the work. As far as I know this fact is not written down anywhere; perhaps no one would know if he had not told me. This is the hidden inspiration for the work. Harvey wrote: Inspiration is the hidden cause: it may be almost impossible for the listener to pinpoint its presence in the finished work, yet without it the work would not have the individuality for which, presumably, we admire it. I take it that the composer had got to know this painting during his student days. A composer looks back at the end of his life; the young Mary, just before the start of Jesus’s earthly life, has premonitions of her later sorrow at the foot of the Cross—a strange, sad memory of the Stabat Mater as the composer put it to me. Time moves forwards and backwards in a profound depiction of eternity. This mirror effect can be heard in the music just as it can be seen in Veneziano’s painting. The interplay between angel and virgin is captured in the music to exquisite effect, as solo voices pass the melody between them against a background halo of humming. The composer spoke of a meeting of the supernatural and natural worlds; the work begins with very soft sounds as though hearing voices from outside the building. The poem is about the timeless—a poised rapturous state. Within that are of course emotions, but the spell must not be completely broken. I think of The Annunciation as representing a distillation of the composer’s musical essence—it has a purity and simplicity of means whilst still seeming new.